crafting with katie: Enjoy the Simple Things! When I was making my circle swing cards last week, I was left with this half circle of green patterened paper. It reminded me of a hill, so the idea for this card came to mind. It's an A2 size card, and I used the Imagine Best Friends cartridge to make the cloud patterned paper. This adorable tree with swing is from the Cricut Just Because Cards cartridge. It's cut at 8" (not real size of course). 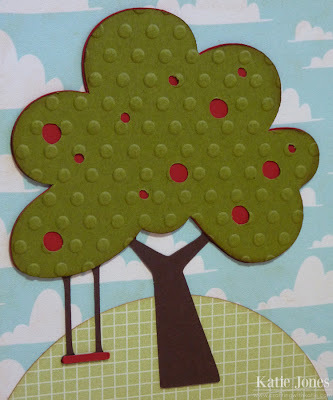 I ran the green layer through my Cuttlebug with the Polka Dots embossing folder. 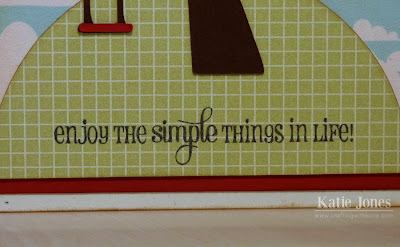 I thought that this sentiment from My Creative Time's This & That stamp set was just perfect for a tree with a swing! Katie ~ OMG!!! You are so CREATIVE to use the half circle as a hill!! Okay that tree is too CUTE and the embossing! I have to say you used the PERFECT senitment too!!! I have to go look at this cartridge ~ I LOVE and may need to use this tree soon!!! Thanks!! Nice tree cut and I like the dots embossed on the apple tree...very cute. 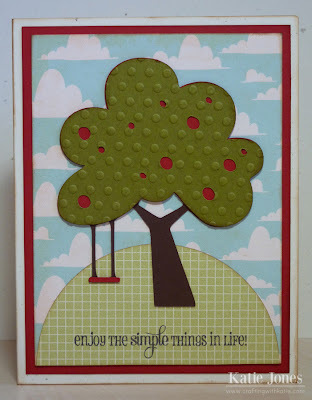 This is so cute, I really like this image and the embossing on the tree!! Oh Katie, you always amaze me.. i need to use my imagine more.. lol.. i need to use just one of my machines. This is so sweet.